Traditional Catholic Musings: The consecrations, Bishop Williamson and the General Chapter. The consecrations, Bishop Williamson and the General Chapter. 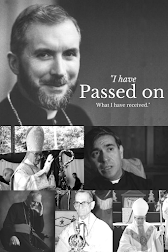 This week marks the thirtieth anniversary of the consecrations of the four bishops by Archbishop Lefebvre. This ‘operation survival’ continues through the work of Bishop Richard Williamson, who sadly, is the only one of the four who continues to resist modernist Rome under the same principles as the Archbishop. As Bishop Williamson celebrates his anniversary in America with a biography of himself written by Dr David Allen White, what can we learn from his tenure as a bishop? I was told in the past that he was never as ‘hard-line’ in many regards as two of his fellow bishops, yet when the tough decision had to be made, to not compromise when it mattered most, he came through in spite of the fact that it had life changing consequences. For who can doubt that he did not foresee ending his time in Broadstairs, away from long time confrères including those he ordained. How it must hurt to see how few of those he taught, had the courage to stand up against discomfort. Many have no wish to hear his name and those who do, now only whisper his name publicly in case overheard and reported. Not only does he have that cross to bear, but even among those aware of Menzingen's treachery, do we find priests who under the guise of asking him ‘to lead’ in practice they wish for a cardboard cut-out bishop who will do their will. What of his fellow bishops, Fellay aside, how will they celebrate this anniversary? In spite of many previous assertions otherwise, Bishop De Galarreta is now standing side by side with Bishop Fellay. What of poor Bishop Tissier de Mallerais? When one looks at his writing over the years, for example, here, and here, (not forgetting the letter of three Bishops) how can he acquiesce? His part in all this is perhaps hardest to explain as he more than almost anyone would appear least likely to capitulate. Emotionalism? Perhaps. But there is still time. The up-coming general chapter gives those religious an opportunity to once more stand up and refuse to accept that modernist bishops have a ‘right’ to interfere in SSPX weddings, that any deal with Rome must deal with doctrine first and that the SSPX has lost its way and must return to the (true) position of Archbishop Lefebvre. If we can learn one thing from Bishop Williamson, it is this - that some people have an opportunity in life to be heroic. To make a stand when they have no material or any other gain to be made from it, other than testifying to the truth and by this, witnessing to Almighty God. Let us hope and pray that at the Chapter some may take that opportunity.